What an experience that must have been.... burning that poor kids retinas with you white skin. I'm reading everything again. True adventure, guys, true adventure. what a great story...please keep updating. My mother in law was born in the Belgian Congo, her family fled the country when she was around 8 or 9 i think, and they returned to Liège where they were from originally. She came to the US as a foriegn exchange student and eventually got married. Now she teaches french and one of the local schools. Great write up your describe the adrenaline highs felt so well. 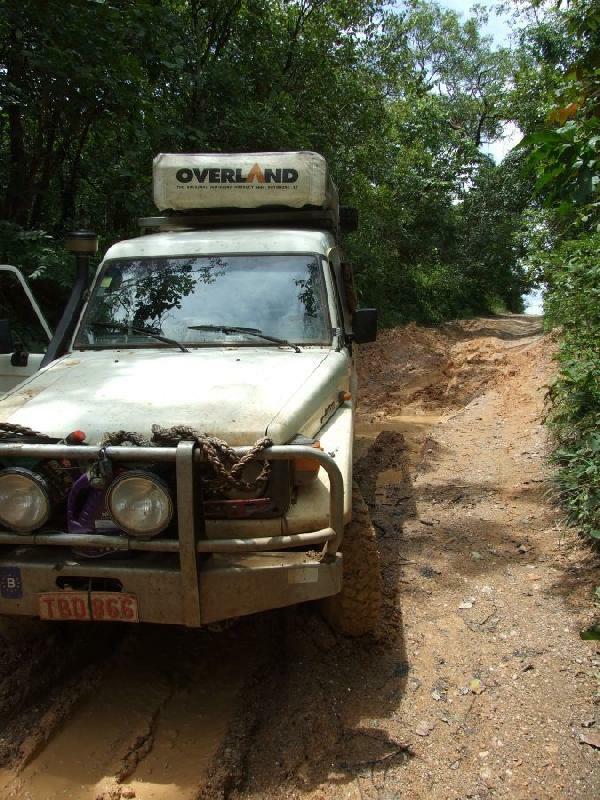 Parts of West Africa and the DRC are tough for any overlander and we too felt like they saw us as "walking ATMs" it is so sad. 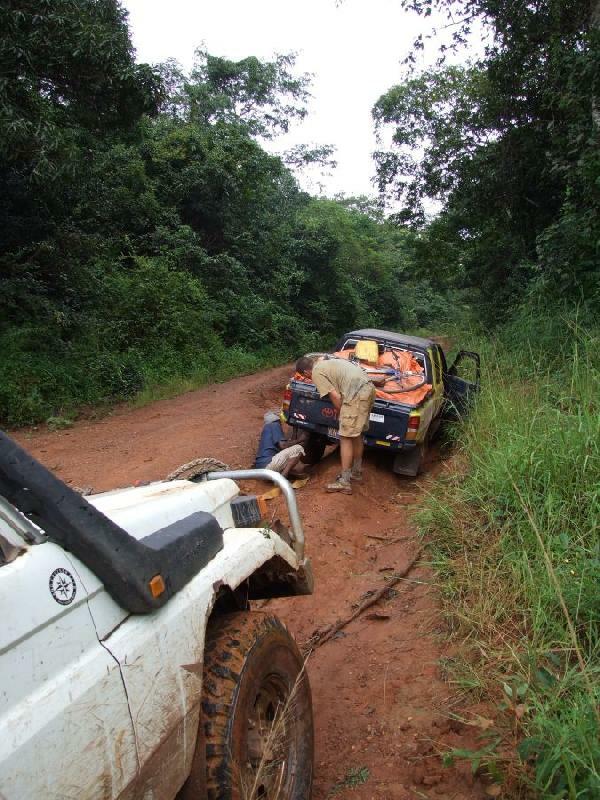 The DRC has to be the toughest country to traverse in West Africa if not the continent. For many many reasons. EDIT: Come back to this on 29th August 2013 for a re-read only this time we have driven to Siberia in our Land Rover. This story is still on top of our inspirational list. Thanks again guys, keep on rolling and stay safe. Thanks for all the positive comments thus far! We were still aiming for Luena. The road was ok but had lots of water in so called "flaques d'eau" - "Puddles". Often the road would be completely immersed. It could be less then 1 cm deep, but it might as well be 1 meter deep. We (I )had learned my lesson from yesterday so we really stopped before every obstacle. Josephine did the recce. And then we continued... carefully. It took a lot of time, but getting stuck takes a lot more time. We came across another vehicle. Every vehicle we saw in the last few days was stuck it seems. They were on their way to Kananga. Same directions as us. 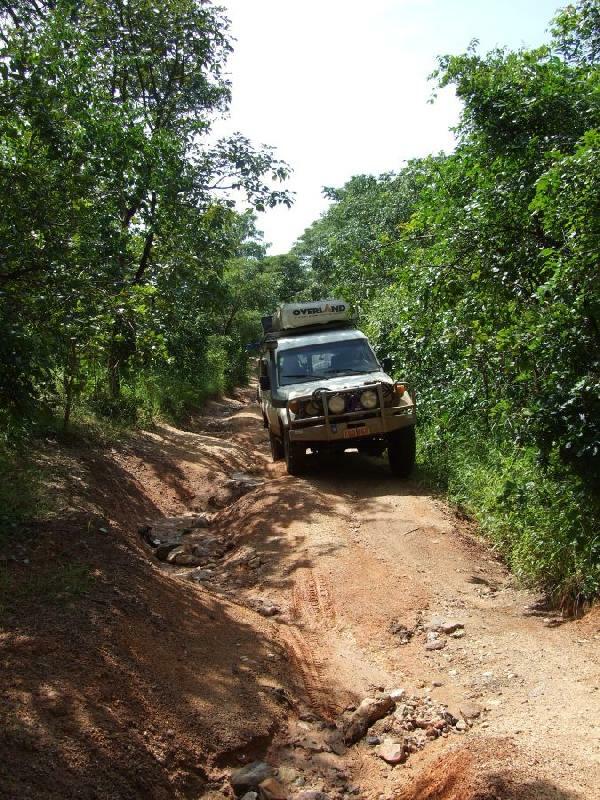 They had bought the vehicle in Lubumbashi but did not have the money to transport to Kananga, so they decided to drive. They were pretty deseperate by now as their "new" car getting damaged by the road and it took them much longer then anticipated. We would pass eachother a few times. We never knew if they made it to their destination. There is no trough traffic at all on this traject. All transport in the area is done by train. 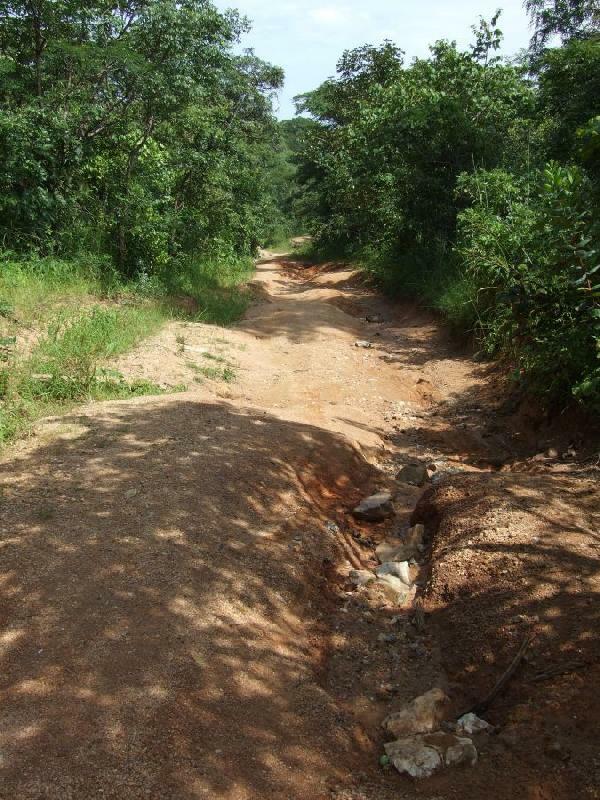 There is an old colonial trainline between Lubumbashi and Kananga. All transport is done via this train or by air. All in all it was a plesant day. 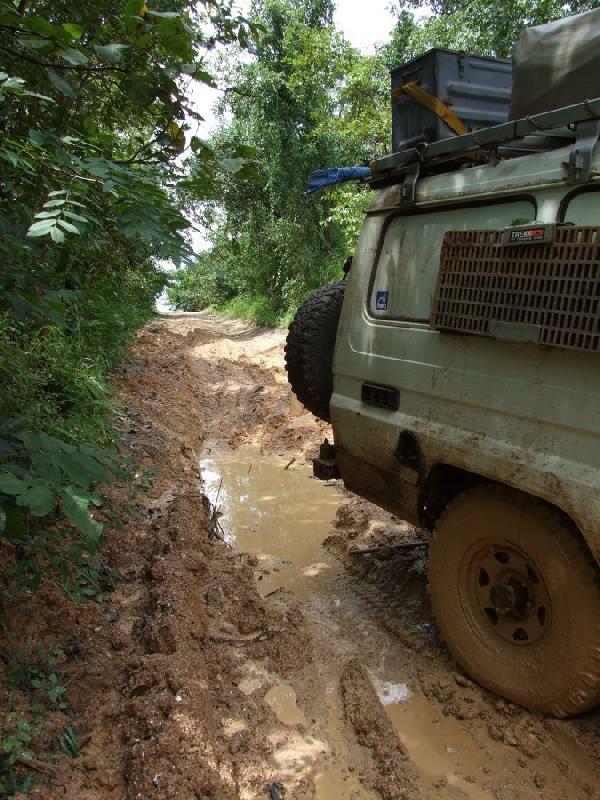 Sun was shining (that's good because it dries out the roads), no major problems with police, and above all: it was the first day since we entered congo that we did not get ourselves stuck! What a feature! We left at 5 this morning and arrived in Luena at 14:30. 50 km's covered. We had received the contact details from Frère Louis via our connections in Lubumbashi. We had already called him, but unfortunately he was not home. He was at the main mission post in Kamina for some meetings. He was kind enough to inform his own mission that we were coming and to let us stay there. And so we had a leisurely afternoon at his mission. We must say that at first we were a bit dissapointed. Thus far the missions were havens of peace and quiet. Were things were functional (sometimes) and clean (sometimes). Not so at the home of Frère Louis. He lived like the Congolese lived... in a rundown building without any comfort. He had a bathroom that hadn't seen a brush in ages,.. . It struck us as a bit odd, but later we would understand that Frère Louis is one of these rare people that does not care about himself, but only about the others. We would meet Frère Louis later on this trip and everything would become clear then. 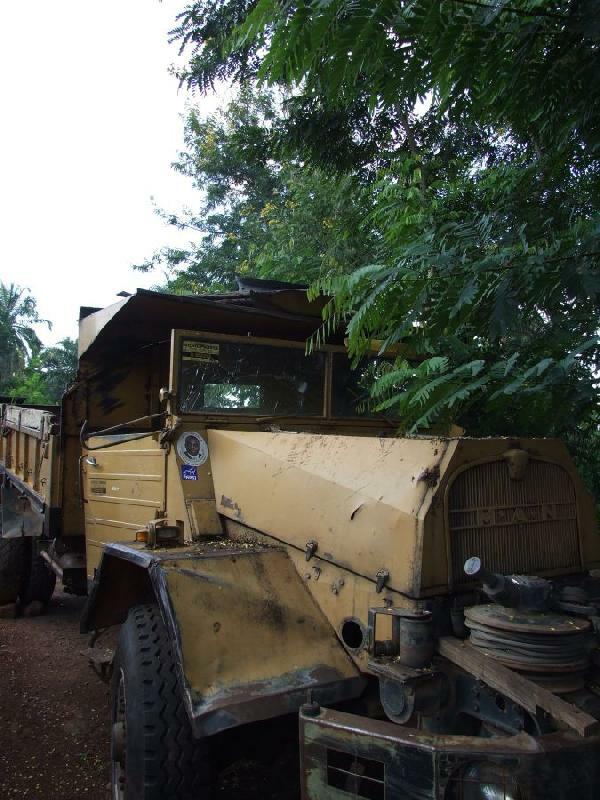 He uses this truck to get supplies from Lubumbashi to all of the project he is running in the area. The big wheels, the portle axles and the huge winch make it a capable bundybasher. It is expensive to run (fuel) so it does not see much action. He had two of these.. but one was broken. While we were there several people came to visit. Among them was a friendly older lady. She had beautiful (homemade) clothes. She was responsible for the orphanage that was run by Frère Louis. Her name was Henriette Raman Kitwa Jujinga. What a lovely name it is. She told us a bit of what she did. I can no longer remember how many orphans they had, but it was enormous! She also said that there were many many more orphans that they could not help. She invited us to visit the orphanage and suggested that maybe we could help. We declined Our moral was low already, we were exhausted and above all we knew that they would ask us for all sorts of things we could not give to them. The only thing we would have left behind would be dissapointment. I am looking at her phone number now in Josephines notes. I wonder how she is doing.. It rained again last night. The rainy season had really started now. Our tent is leaking badly. It seems as if every second raindrop just falls straight trough. Our mattres, pillow, etc... are all soaked. During the day it is hot and sticky. Too humid to let it all dry out. Mould is starting to form on our mattress now. Not nice.. 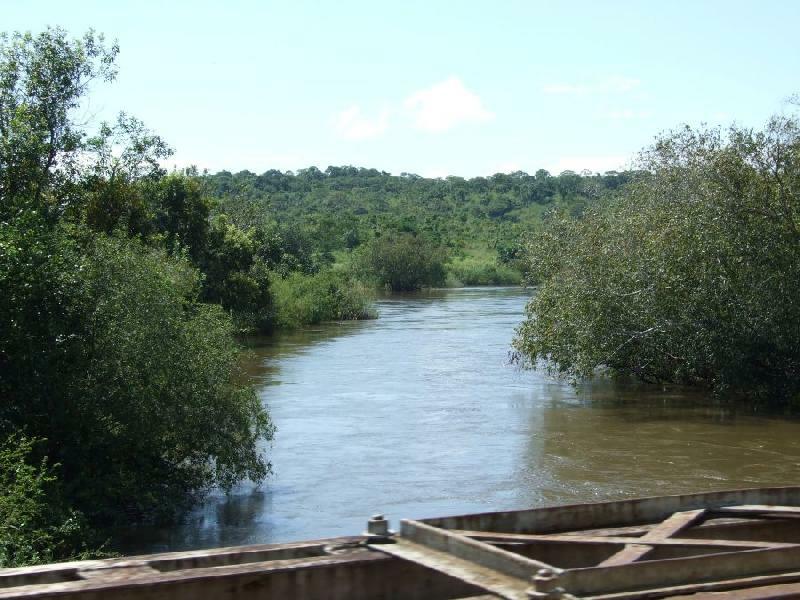 Shortly after Luena we have to cross the Lubidi river. We were told there is a bridge, and indeed. The bridges were something we were very concerned about upfront. 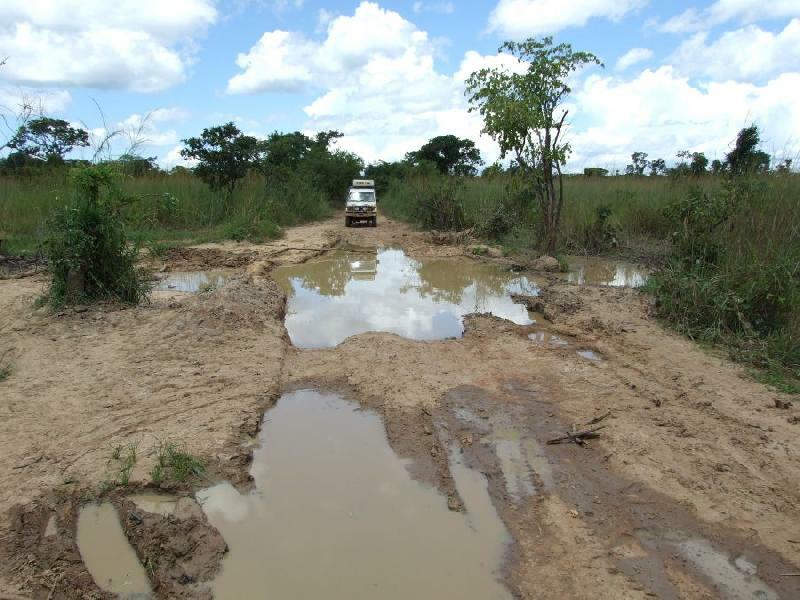 Congo has a lot streams and rivers and we knew the roads had not seen maintenance in many many years. If a bridge broke down, that could be a major problems. Up until now however we did not have any problems with the bridges. Some of the smaller bridges might have been dodgy, but all of them were passable. 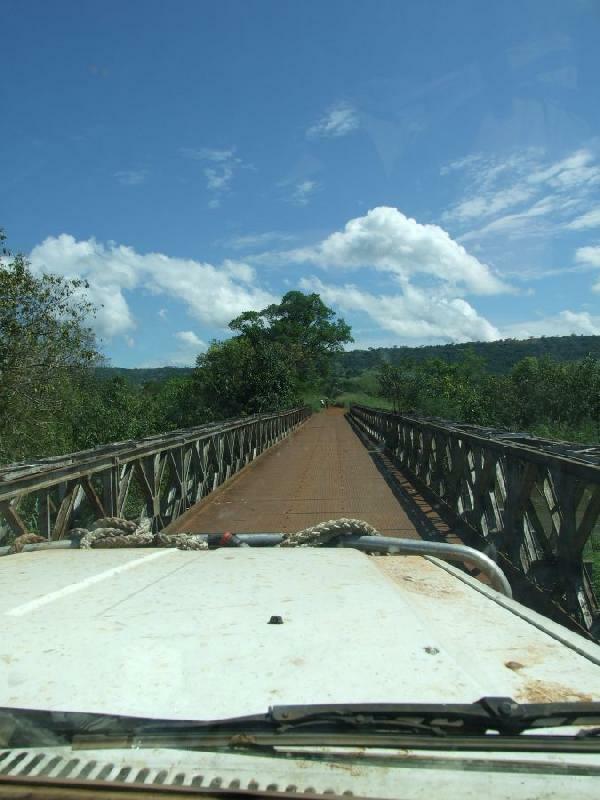 Most of the large bridges were fortunately made out of steel and in reasonably good nick. Take the bridge we just crossed for example. I find it amazing that is still there. 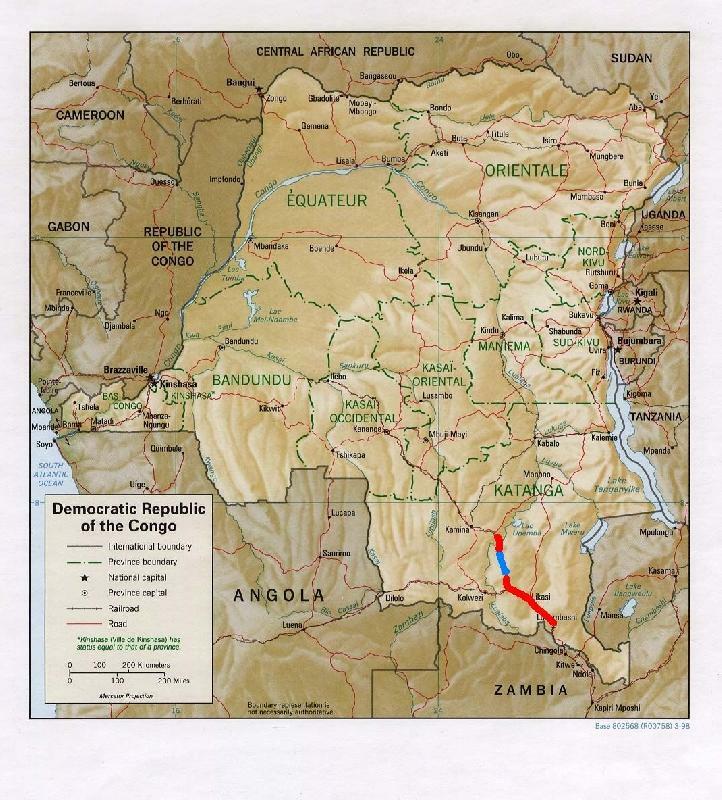 Numerous armies have crossed the Congo in the last 20 years, chasing their enemies down to the capital. Now, I am not a military expert, but if my army was losing terrain to the enemy army and I have to retreat. The one thing I would certainly do was blow up all bridges after me. Had it happened but was the damage so small that it could easily be repaired? Or did they just not bother? Or did they lack the explosives and time to actually blow it up? Who knows.... but at least the outcome is good for us now! After the bridge was a long climb on a hill. The road was filled with rocks the size of small cars. Josephine had to guide me trough in 1st gear low. Very technical driving. All of a sudden we hear somebody approaching. Running. He does not even look at us and speeds past us. A few seconds later another young guy speeds past us. We stop briefly to check out what is chasing them but cannot see anything. This is odd... very odd. Congolese man are strong and explosive. But the only time we've seen prove of their strength is when they are working. 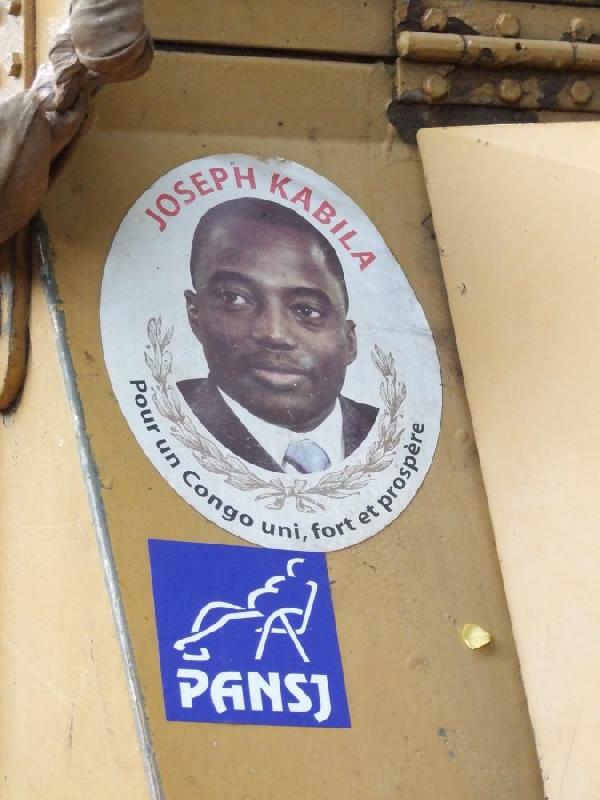 We had never seen a Congolese run... just for the fun of it. We continued slowly and started to get worried when more men hurried past us. Something was up.